A fire in an apartment building in Paris has now claimed 10 lives, officials have said. Police have taken 40-year-old woman into custody in connection with the blaze. According to reports, she was arrested not far from the property on rue Erlanger in the 16th arrondissement. It is believed the fire started shortly after a dispute between neighbours in the building. A criminal investigation has been opened. The blaze, which began on the upper floors of the eight-storey apartment block in the 16th arrondissement and spread to other parts of the building, injured another 30 people - including six firefighters - before it was brought under control some five hours after it was reported at about 1am. According to officials, all the victims were residents. #Intervention Feu d'immeuble Paris 16 : 50 sauvetages, 8 personnes décédées, 1 urgence absolue, et 36 urgences relatives. 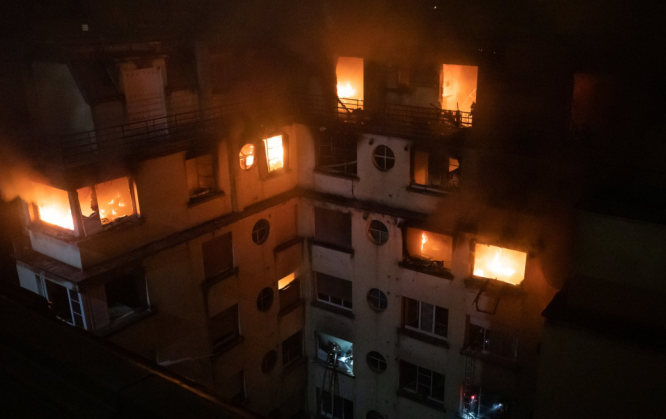 Fire service spokesman Captain Clement Cognon warned AFP at the scene early on Tuesday morning that, "the toll could still rise" because firefighters were yet to search the upper floors of the eight-storey building, "where the fire was the most violent". Some residents of the property, which was built in the 1970s, took refuge on the roof to escape the flames, while many called for help from their windows. "About 30 people were evacuated on the ladders," said Captain Cognon. In total, firefighters at the scene rescued 50 people. Two adjacent buildings were evacuated for safety reasons, while emergency services' vehicles blocked access to several streets in the neighbourhood, on the fringes of the bois de Boulogne. Officials said the woman who had been detained had a history of mental health issues. Paris Mayor Anne Hidalgo, along with politicians including Interior Minister Christophe Castaner, were expected to visit the scene at some time on Tuesday.